WHY CAN’T YOU FIND A HOME IN GREENFIELD? Home » WHY CAN’T YOU FIND A HOME IN GREENFIELD? GREENFIELD — Crawling into the space under the wooden steps of a decrepit Bank Row building, Ralph Provost was shivering. It was snowing and the temperatures were dropping as the sun set. Before the short, 61-year-old man could squeeze into the dark den, he had to strip away the several coats he wore. Otherwise he couldn’t fit through the opening. Head on swivel, Provost watched as traffic skidded up and down the hill that serves as a main artery into the center of town. Ralph Provost sits in The RECOVER Project’s community space for a portrait Friday in Greenfield, Nov. 16, 2018. Provost spent a winter homeless, sleeping under the stairs of a building under construction. 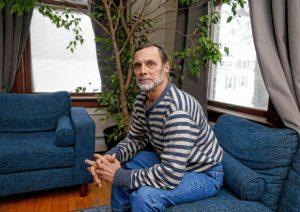 Now Provost lives in a ServiceNet transitional home, but is unsure where he is able to go next with his current income. It might have been the dead of winter, but he didn’t want to attract any attention. He waited for a quiet moment to stuff himself unnoticed into that small space he called home for 10 months. When renovations began on what’s now the Northwestern District Attorney’s Office building, Provost finally had to find a new home. It’s been nearly 1½ years since Provost was living on the streets of Greenfield. Since then, he spent 72 days in the ServiceNet overnight shelter on Wells Street, despite a social anxiety disorder that makes it difficult for him to stay in such close quarters with others, and he now lives in an apartment owned by ServiceNet. He pays the social service provider $308 of his $1,000-a-month income, all of which is from disability payments, which he says he gets because of a neck injury from a car accident and his anxiety disorder. He has his own bedroom now, a communal shower and peace of mind knowing he won’t freeze this winter. What Provost doesn’t have is clear prospects for an apartment for the future. He can’t stay where he is forever, or at least that’s not the intention of the program. He has been on wait lists for subsidized housing for low-income people for the past year and has been unsuccessful at finding a place he can afford without a government subsidy. In Greenfield, for many people, it’s hard to find an apartment, especially an affordable one. The effects of the town’s tight rental market is more dire the lower down the economic ladder you stand – and it’s worse for people like Provost as the tight market pushes them into homeless shelters and onto the streets, into the woods, or even as we saw this summer, on the Greenfield Common. 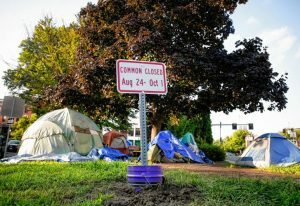 The encampment by about 20 homeless people on the Greenfield Common this summer was one symptom of an intensifying affordable housing crisis in Greenfield, the county seat and source of regional social services that tend to attract many lower-income people, especially those without cars – although it’s a problem seen across the nation in cities large and small, and certainly not unique to this city or region. Today, it’s not only harder to find an apartment that is affordable, it’s harder to find an apartment, period, local landlords and social service providers say. The affordable housing crisis is characterized by steadily rising rents, low and stagnant wages and little to no new affordable housing being built. Signs have been placed on the Greenfield Common on Wednesday giving notice that it will be closed to everyone from Aug. 24 until Oct. 1. In 2016, American Community Survey census data, used by the Franklin Regional Council of Governments, shows there were 8,229 dwellings in Greenfield, with 7,729 of them occupied — leaving about a 6 percent vacancy rate in all available housing, although the rental market has a lower vacancy rate. At the lower economic rungs, many people can’t find apartments they can afford and wind up turning to state subsidies or become homeless. Out of the roughly 7,700 homes, about 4,300 of them are owned and 3,400 of them rented. 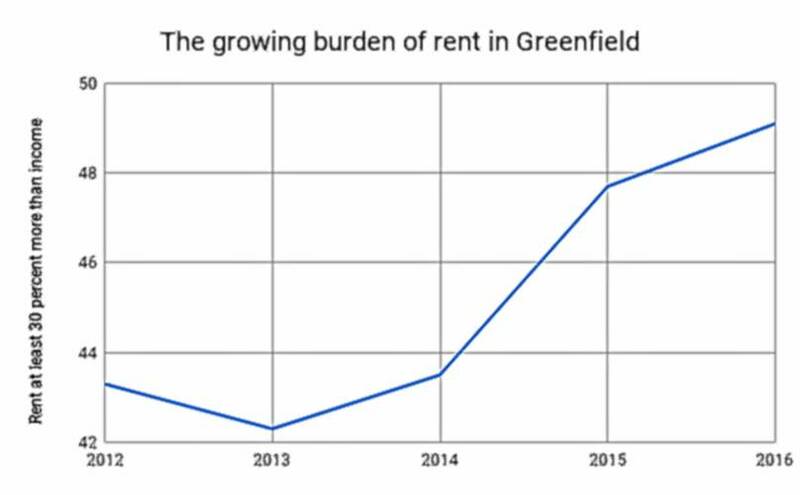 Half of all renters in Greenfield, similar to those across the state and country, are considered “burdened” by the cost of rent, meaning they pay a third or more of their gross income toward rent. Although acknowledged as imperfect, the 30 percent “burden” standard, given its simplicity, still “remains a reliable indicator of affordability both over time and across markets,” according to a September report out of the Joint Center for Housing Studies of Harvard University. A National Low Income Housing Coalition 2017 study stated there is not a single county in the country where a minimum-wage earner can afford an average two-bedroom rental. The most recent data suggests it would take nearly $29 an hour to afford this in Massachusetts in 2018, the state with the sixth highest cost. The typical rental in Greenfield went for $836 in 2016, according to the ACS data, compared to a cost statewide of $1,129 and nationally of $949. That might seem like a good deal, but not if your income is low also, and the Franklin County area is among the poorest in the state. In 2016, 49 percent of Greenfield renters were “burdened” by their rent, just behind the state average, 50 percent, and the national average, 51 percent. While the typical cost of rent grew at about a 9 percent clip from 2011 to 2016 across not only Greenfield, but also the state and country, in Greenfield wages did not match that rise in rent, making it more difficult for the typical renter here. This is where the affordable housing problem began to grip Greenfield more tightly. In 2012, about 43 percent of renters were burdened by their cost of rent. By 2016, 49 percent of renters were burdened. 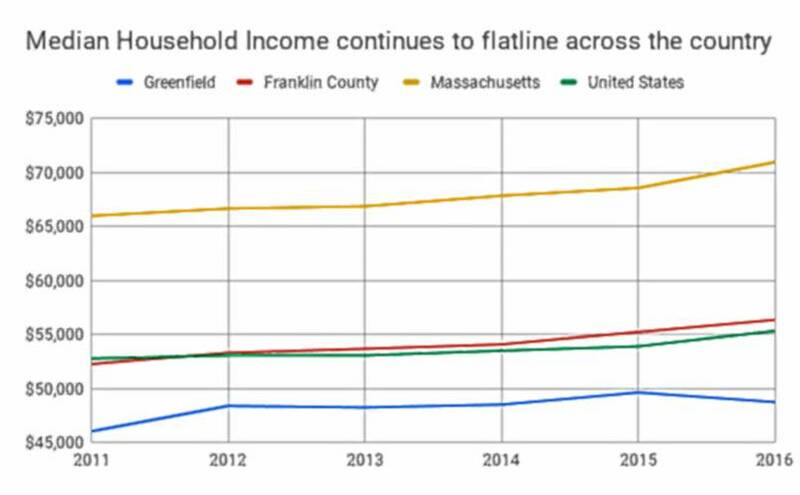 From 2011 to 2016, households making $35,000 to $50,000 steadily dropped in Greenfield, from representing 18 percent of households to 13.5 percent. It was the greatest change of any income bracket over that time. Greenfield traditionally has high rates of poverty. 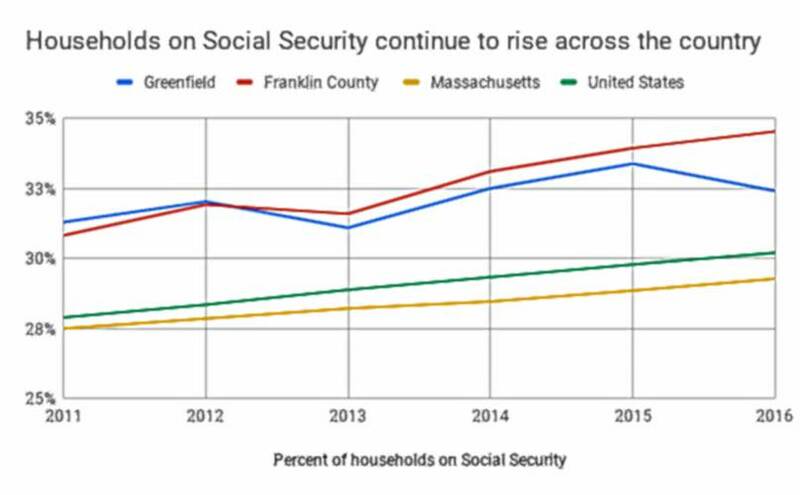 About 32 percent of Greenfield households are on Social Security, compared to 29 percent in the state and 30 percent in the country. Similarly, Greenfield has a higher percentage of households receiving SNAP, food stamp benefits. The state average was 12.5 percent in 2016, the national average at 13 percent, and Greenfield was at 17 percent. Housing costs have continued to climb. On Craigslist, the primary place for posting rentals in the area, the cheapest one-bedroom was going for $720, without utilities, and others drifted into the $900 range, in a recent sampling. When housing eats into income to such a degree that it “burdens” a household, less money is available for other necessities and activities of daily living, placing increased stress on people of low or fixed incomes. Complicating things is the lack of apartment selections. 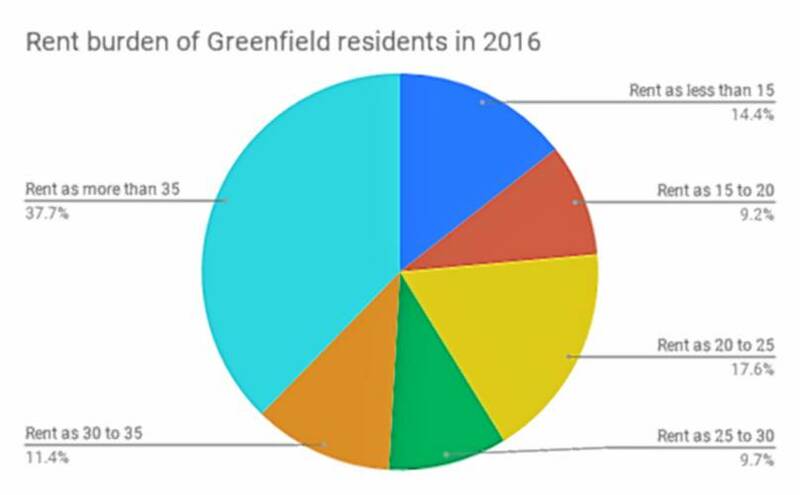 In Greenfield in 2016, only 3 percent of potential rentals were vacant, compared to a national average of 6 percent and a state average of 4 percent, the survey shows. People in town, including Mayor William Martin, often wonder why people who are homeless can’t just get into the ServiceNet overnight shelter on Wells Street, and find future success when helped there. There have been 20 beds available for people there for well over a decade, which means that except for moments of emergency, there is a fixed number of people that shelter can help. Statistics from ServiceNet show fewer individuals are using the overnight shelter in recent years, but not because there is less need. Instead, the agency says, the need is still very much there, but the average length of stay has doubled in the past decade, because it’s difficult to find more permanent housing. The shelter was supposed to be an “overnight” stop-gap, but has become something more permanent for those lucky enough to get in. There is now a waiting list. Of those who do leave the shelter, one in two ends up without any documented place to live. ServiceNet says this is typical of shelters, but it also means half of its clientele likely did not find housing after using its services. Experts assume these people just end up homeless again. In recent years, Greenfield has not become richer. In the one-time well-off, blue collar factory town, well-paying industrial jobs have become less plentiful than in the post-WWII era. Lower paying jobs feed into the difficulty of affording rising rents. Demographics have continued to change as well, with some recent college-graduates moving up from Hampshire County along with lower-economic families from the Amherst, Northampton and Springfield areas. This academic year, 49 percent of public school students are considered economically disadvantaged, including 65 and 67 percent of students at Federal Street and Newton schools, respectively. This has steadily risen in Greenfield over recent years. Rising rents, fewer apartments, less wealth: a potent brew that pushes more people to the lower rungs of the economic ladder and has caused increasing numbers to fall off altogether. 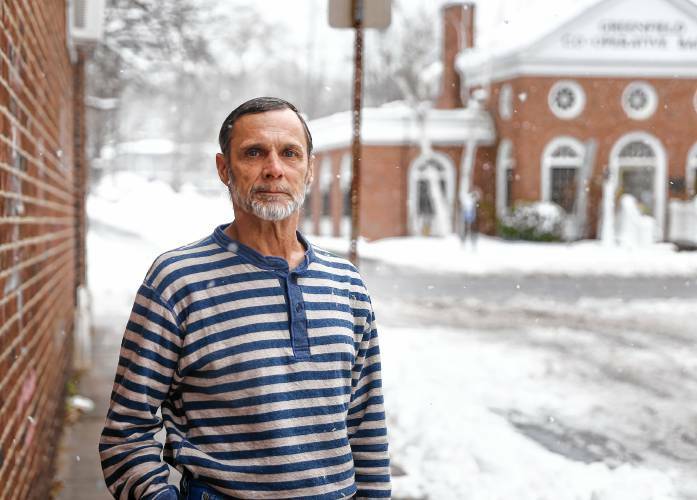 Now living on School Street through a ServiceNet program, Ralph Provost — a relative success story when measured against many of his peers — recognizes he will never find market rent apartments with his $300, which is what he pays now. His only chance of housing is getting a Section 8 rent voucher, which would allow him to pay 30 percent of his income for rent for an apartment in the county. He said he’s heard that now that he’s been with ServiceNet, he may have a better chance of getting one, but isn’t betting on it. And he knows many people who cannot find anywhere safe or decent to use their Section 8 voucher anyway, once they get it. TOMORROW: Why can’t we build more affordable housing?